Pedestrian City designed and delivered mapping workshops as a tool for participatory engagement, inviting children and adults to engage in critical analysis and dialogue around pedestrian and public space issues in their neighbourhoods. Workshops were held in coordination with Hub for Action on School Transportation Emissions, Sustainable Cities, Prince of Wales Secondary, and the Vancouver Public Space Network. An urban geographer and advocate for pedestrian-scale development, I am curious about the connections between urban form, perception and experience of place, and how these influence movement through cities. With a keen interest in psychogeography and memory maps, I opted to undertake a major project rather than a thesis for my Masters in Environmental Studies at York University. 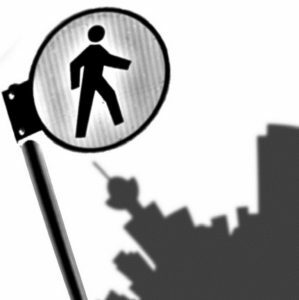 Pedestrian City began with a study of a Toronto neighbourhood. Inspired by the work of Jane Jacobs, Jan Gehl, Michel De Certeau, and Guy Debord and the Situationist International, Pedestrian City brings together individual experiences of walking in a city and offers a starting point to improve the pedestrian realm. I am also one of the creators of the Gramorail, a pedal-powered railcar built in partnership with eatART and the Vancouver Design Nerds.